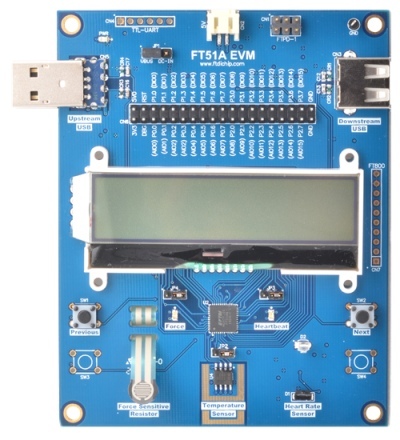 The FT51A-EVM is a development module for FTDI’s FT51AQ, one of the devices from FTDI’s range of 8-bit microcontrollers with USB interface bridging features integrated. FT51A is a MCU which includes the following features: USB client and USB hub interfaces, 8051 core, 8-bit ADC, UART, SPI, I2C, 245 FIFO and PWM. The FT51A-EVM demonstrates the FT51A series I2C and SPI interfaces, the ADC input, PWM and GPIO features. It contains a 28 pin header which allows easy access to all the FT51AQ’s IO pins, as well as the debug and reset pins. This module also comes preloaded with the FT51A-EVM firmware that allows users to use all the features of the module without developing firmware. The FT51A-EVM is fitted with a FT51AQ; many of the features of the FT51A series can be utilized with this module. For a full list of the FT51A series features please see the FT51A datasheet. 20×2 characters, LCD display, with I2C interface and RGB backlight. Upstream and downstream USB ports which allows for direct connection cascading. Debugger interface header used for debugging and programming the FT51AQ. Designer for operation with FTPD-1. Onboard jumper for configuring the module to be in self powered or USB powered.